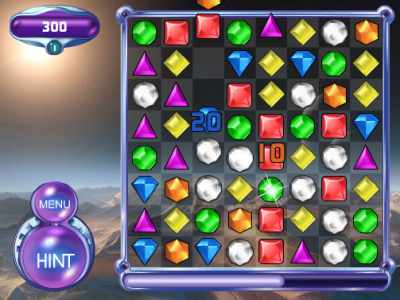 Many gems of different colors and shapes are placed in a random order on a game area. You'll have to swap these gems by two to align three of them on the same line, so they can disappear from the area and bring you some points. An addictive puzzle game, inspired from a Russian game named Shariki, sharing many similarities with the very famous Tetris. Available in a free version on the internet, this game has been declined in several variants, some being commercialized as "Deluxe" versions with additional features, including a soundtrack composed by Peter Hajba, better known in the Amiga demoscene through his nickname, Skaven.